The management of venous thromboembolism in the cancer population is clearly established. Low molecular weight heparin has a greater efficacy than warfarin in the treatment of cancer-associated thrombosis and is recommended as the preferred therapy. However, the evidence informing these recommendations excluded patients with poor prognosis or performance status, thrombocytopenia, bleeding or brain metastases. Furthermore, there is limited data on the management of venous thromboembolism resistant to anticoagulation, a phenomenon frequently encountered in the advanced cancer population. This paper will review the management of cancer-associated thrombosis with a particular focus on challenging clinical situations faced by palliative care teams looking after patients with advanced disease. Most participants in the clinical studies that inform the evidence base for the management of cancer-associated VTE were relatively fit ambulant patients (Eastern Cooperative Oncology Group (ECOG) 0-2). Therefore applying treatment guidelines to those with poorer performance status, such as the majority of those cared for in palliative care settings can be difficult. This article reviews the current evidence for managing secondary prevention of cancer-associated thrombosis. In addition it will focus on challenging clinical problems where there is no current evidence to inform practice. Management of patients with VTE and advanced cancer is challenging for several reasons. First, there is an increased risk of bleeding and recurrent VTE with anticoagulation, particularly with vitamin K antagonists (VKA) compared with non-cancer patients.13,–,24 As the cancer progresses, so too does the risk of VTE and bleeding.25 Several factors contribute to this: decreased patient mobility, compression of venous return by tumour masses and the presence of highly vascular ulcerating lesions. Furthermore, worsening disseminated intravascular coagulation will result in increasing activation of the coagulation cascade and a tendency to bleed. Thrombocytopenia, due to marrow invasion or as a complication of treatment, may further increase the risk of bleeding. Second, the advanced cancer population is difficult to define since the term ‘advanced cancer patient’ refers to a highly heterogeneous group of differing histology, performance status, metastatic burden, mobility and prognosis. These physical variables will affect patients' thombogenicity and bleeding risks. The direction of patient care will often change to a focus on quality of life rather than quantity. It is vitally important to involve patients in their own management plans, particularly at this stage of their lives. Their wishes will be influenced by their current goals and fears in addition to the symptom burden of their disease. For some, a relatively minor insult such as a small PE or minor DVT may have a disproportionately large impact on quality of life while others may consider the potential consequences of treating their VTE to exceed the symptoms. Studies informing the management of cancer-associated thrombosis have all been conducted under the assumption that the patient should receive anticoagulation, with the research question focusing on the choice of anticoagulant to be used. Even in the cancer population, where anticoagulation carries additional hazards, for the majority of patients the benefits of treating symptomatic VTE far outweigh the risks. However, in the palliative care setting the clinician may encounter situations where treating the VTE could be inappropriate or a patient already on anticoagulation should have it discontinued. There is no evidence to guide these decision-making processes and so we would suggest a pragmatic approach. As discussed before, the progression of malignant disease brings with it increasing bleeding complications and the potential hazards of anticoagulation should not be underestimated. Long-term anticoagulation in the absence of objective radiological confirmation seems counter intuitive and if investigation of a suspected thrombotic event is considered inappropriate, then arguably so is anticoagulation. Similarly, it would be inappropriate to investigate a suspected thrombus if there were no intention to treat the suspected VTE. If a patient is near the end of life, with anticipated deterioration any symptoms attributable to VTE could be managed with appropriate end of life medications. For patients who are not imminently dying, anticoagulation may be useful in relieving symptoms attributable to VTE. 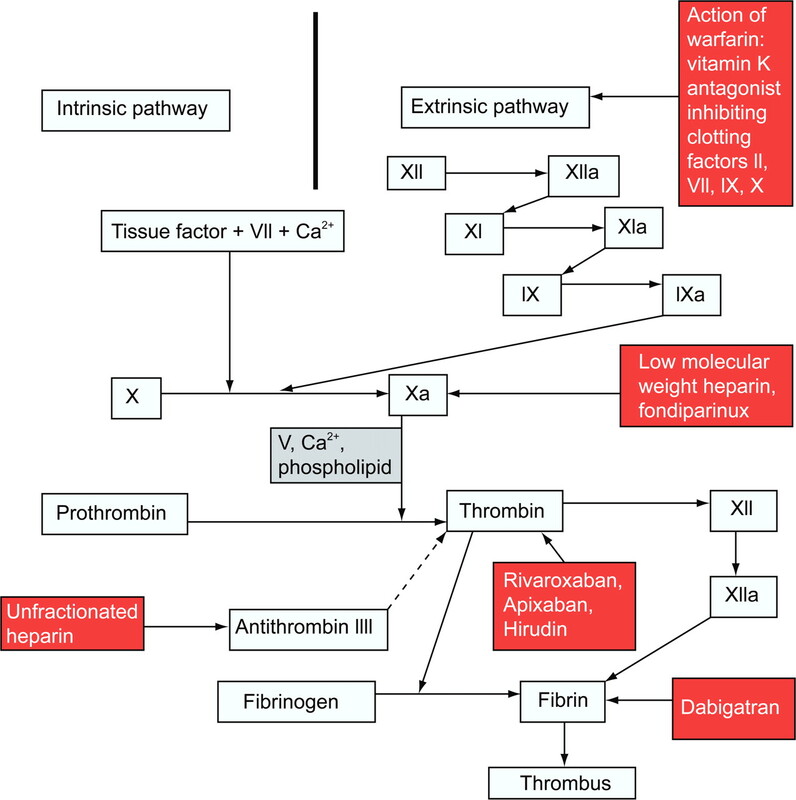 The anticoagulants that are commonly used in symptomatic VTE are illustrated in figure 1, which identifies their sites of action within the coagulation cascade. The treatment for VTE in the general non-cancer population consists of 3–6 months anticoagulation with warfarin after initial anticoagulation with weight-adjusted low molecular weight heparin (LMWH).24 The use of VKAs such as warfarin in the cancer population, however, is associated with bleeding rates as high as 21.6%23 25 and the initial warfarin loading in advanced cancer patients has reported international normalised ratios (INRs) greater than 4.5 in over 60% of patients and greater than 8 in 30%.26 Maintaining a stable INR is similarly difficult due to poor nutritional status, liver metastases, variable oral intake/drug absorption and drug-drug interactions. Meyer and colleagues randomised patients with cancer and VTE to 3 months of treatment with either LMWH enoxaparin (1 mg/kg) or warfarin.22 The composite outcome of major bleeding and recurrent VTE was observed in 15 out of 71 (21.1%) patients receiving warfarin, compared with 7 of the 67 (10.5%) receiving LMWH (p=0.09). The long-term innohep treatment evaluation trial randomised 200 patients with acute VTE and cancer to receive either unfractionated heparin (UFH) followed by warfarin for 84 days at a targeted INR of 2.5 or the LMWH tinzaparin (175 IU/kg) for 85 days.19 The rate of recurrent VTE at 3 months was 6% in the LMWH group compared with 10% in the warfarin group and at 1 year 7% and 16% respectively (p=0.044). Occasionally, a cancer patient will have VTE resistant to LMWH because of subtherapeutic levels of the drug or tumour driven direct thrombin activation which will bypass the factor Xa, thus rendering LMWH ineffective. Recurrence of VTE despite therapeutic anticoagulation with LMWH confers a poor prognosis and published data on its management is limited. The focus of management should be on reducing the symptomatic burden without introducing new symptoms from changing therapeutic approaches or complications of therapies. Possible approaches include increasing the dose of LMWH, if sub-therapeutic, changing to twice-daily injections to minimise trough levels, or switching to intravenous or subcutaneous UFH, where direct thrombin activation is suspected or rapid reversal in a highly thrombotic state prior to surgery is needed. In the CLOT study, the LWMH dose was reduced to 75% after 1 month.21 Therefore the initial management of recurrent VTE should be to ensure that, if the dose has been previously reduced, full weight adjusted dose LMWH is reinstated. If this does not work, there is little in the published literature to guide the clinician. A case series of 47 cancer patients with recurrent VTE despite full weight-adjusted LMWH describes resolution of VTE attributable symptoms within following an empirical increase in LMWH dose by 25%.36 However, there is insufficient evidence to recommend this routinely. The utility of anti-Xa level monitoring in this situation is unclear. To date there are no studies supporting the use of anti-Xa levels to guide LMWH dosing in the cancer patient and published data is limited to a single case report.37 Further management requires liaison with haematology colleagues for guidance and it is likely that treatment plans will be developed on an individual patient basis. The role of anti-Xa levels in the dosing of LMWH in cancer-associated thrombosis needs further research. Assuming LMWH levels are therapeutic, it is possible that direct thrombin activation is the underlying driver of recurrent VTE and a change to UFH may be warranted. The new oral direct thrombin inhibitors may have a future role to play in the management of this challenging patient group. However, it is unclear yet whether the theoretical benefit of direct thrombin inhibition will bring with it an increased risk of bleeding. The role of new oral anticoagulants including direct thrombin and factor Xa inhibitors is discussed later in this article. Thrombocytopenia increases the risk of bleeding in cancer patients and is elevated further by anticoagulation. LMWH has not been formally evaluated in patients with a platelet count lower than 75 000/mm3 and thus guidelines do not recommend LMWH in this situation. However, in patients with symptomatic proximal DVT or PE, options may be limited and the risks of anticoagulation with LMWH must be weighed against the consequences of choosing not to anticoagulate. There is some clinical experience of LMWH anticoagulation in cancer patients with platelet counts above 50 000/mm3 and from the authors experience, LMWH has been used in extreme cases when platelets were as low as 25 000/mm3.26 Monreal et al have described the use of dose reduction in people with thrombocytopenia, using doses as low as 2500 IU dalteparin in those with thrombocytopenia <10 000/mm3.38 Those with thrombocytopenia did not have a higher bleeding complication rate than those without. There is no published evidence to guide the clinician in this particularly challenging situation and management should be tailored to the individual after full discussion of the risks of each treatment option.26 A sensible first step is to try and stop the bleeding if possible. If this is not possible, then nuisance bleeding such as mild epistaxis or haemoptysis should not, in our opinion, prevent anticoagulation in patients with symptomatic VTE in whom the risk of clinically significant recurrence is high. If the bleeding is from a visible, easily monitored source which is unlikely to be life threatening then full anticoagulation should commence (or be continued) with careful review. If the bleeding is due to mucosal involvement by tumour, such as bowel, duodenal, bladder or vaginal disease a more cautious approach of reduced or even prophylactic doses should be used and the patient monitored closely. The haemostatic properties of a palliative radiotherapy should be considered as it is well tolerated and embolisation in carefully selected patients may be considered.39 If the haemoglobin remains stable and bleeding does not worsen, the dose can be slowly titrated up. A twice-daily LMWH regime may smooth out peaks in anticoagulation level. If there is active bleeding of a more serious and potentially life threatening nature (intracranial, retroperitoneal or upper gastrointestinal bleeding), then anticoagulation is contraindicated. There is no evidence that insertion of a vena caval filter improves outcome for cancer patients with VTE who are bleeding and published studies are too small for useful conclusions.40,–,45 The evidence in the advanced cancer population is even weaker and given inferior vena cava (IVC) filters do not reduce symptoms of VTE or improve survival, the use of these devices are limited in the palliative setting. However, for patients with contraindications to anticoagulation, or who continue to embolise despite therapeutic anticoagulation, clinicians may consider there to be few, if any, alternative options and carefully selected, individuals may gain net-benefit. It is important to note that filter insertion does not suppress the underlying hypercoagulable state, and may even aggravate it. In addition, there is a concern that fatal PE might still result from thrombus formation in the vena cava proximal to the filter. Therapeutic advances in cancer management have resulted in people living longer with metastatic disease. VTE will continue to be a challenge in people with advanced cancer because the evidence base is extrapolated from healthier populations using outcome measures which may be less applicable to patients of poor performance status and prognosis. Clinical research in this group has always been fraught with difficulty and robust studies within representative populations will require large-scale collaboration between research teams if sufficient numbers are to be recruited. Likewise, palliative care practice will only change if the evidence is applicable and the outcome measures are meaningful.47 A greater emphasis on patient reported outcome measures, the symptomatic burden of VTE and its therapies as well as over all quality of life assessments are needed. Finally, release of new oral anticoagulants including direct Xa inhibitors (rivaroxaban, apixaban) and direct thrombin inhibitors (dabigatran etexilate) are potentially exciting developments in the prevention and treatment of VTE in the palliative care setting. Both dabigatran etexilate and rivaroxaban have been evaluated in the treatment of DVT and PE showing non-inferiority to warfarin with respect to recurrent VTE and bleeding.48 49 However, the use of dabigatran and rivaroxaban has been cautioned in high-risk groups such as cancer patients until studies with representative numbers of cancer patients are available.50 51 Only 5% and 6.8% of patients, respectively, had cancer and non-inferiority of these agents in this setting, compared with the current gold standard (LMWH) that is yet to be demonstrated. However, until their evaluation in other medical populations has been concluded, their potential role in the advanced cancer population remains theoretical.
. Alterations of hemostasis associated with malignancy: etiology, pathophysiology, diagnosis and management. Semin Thromb Hemost 1978;5:1–26.
. Abnormal coagulation and deep venous thrombosis in patients with advanced cancer. Clin Lab Haematol 1999;21:51–54.
. Extrinsic-pathway activation in cancer with high factor VIIa and tissue factor. Lancet 1995;346:1004–1005.
. Rates of initial and recurrent thromboembolic disease among patients with malignancy versus those without malignancy. Risk analysis using Medicare claims data. Medicine (Baltimore) 1999;78:285–291.
. Coagulation proteases and human cancer. Biochem Soc Trans 2002;30:201–207.
. Venous thromboembolism predicts poor prognosis in irresectable pancreatic cancer patients. Ann Oncol 2007;18:1660–1665.
. Venous thromboembolism in patients with colorectal cancer: incidence and effect on survival. J Clin Oncol 2006;24:1112–1118.
. Causes of death in cancer patients. J Med 1975;6:61–64.
. The prevalence and associated variables of deep venous thrombosis in patients with advanced cancer. Clin Oncol (R Coll Radiol) 1999;11:105–110.
. Carcinoma and venous thrombosis: the frequency of association of carcinoma in the body or tail of the pancreas with multiple venous thrombosis. Am J Cancer 1938;34:566–585.
. Incidental pulmonary embolism in cancer patients: clinical characteristics and outcome–a comprehensive cancer center experience. Vasc Health Risk Manag 2011;7:153–158.
. Risk of recurrent venous thromboembolism and mortality in patients with cancer incidentally diagnosed with pulmonary embolism: a comparison with symptomatic patients. J Clin Oncol 2011;29:2405–2409.
. Complications and failure of anticoagulation therapy in the treatment of venous thromboembolism in patients with disseminated malignancy. Aust N Z J Med 1992;22:119–122.
. Anticoagulation therapy for venous thromboembolism in patients with gynecologic malignancy. Am J Obstet Gynecol 1983;147:369–375.
. [Classical anticoagulant treatment of venous thromboembolic disease in cancer patients. Apropos of a retrospective study of 71 patients]. Rev Med Interne 1996;17:207–212.
. Secondary prevention of venous thromboembolic events in patients with active cancer: enoxaparin alone versus initial enoxaparin followed by warfarin for a 180-day period. Clin Appl Thromb Hemost 2006;12:389–396.
. Bleeding and thromboembolism during anticoagulant therapy: a population-based study in Rochester, Minnesota. Mayo Clin Proc 1995;70:725–733.
. Cancer-related thromboembolic disease in patients with solid tumours: a retrospective analysis. Ann Oncol 1997;8:669–673.
. Long-term low-molecular-weight heparin versus usual care in proximal-vein thrombosis patients with cancer. Am J Med 2006;119:1062–1072.
. Safety and efficacy of long-term oral anticoagulation in cancer patients. Cancer 1987;59:983–985.
. Low-molecular-weight heparin versus a coumarin for the prevention of recurrent venous thromboembolism in patients with cancer. N Engl J Med 2003;349:146–153.
. Comparison of low-molecular-weight heparin and warfarin for the secondary prevention of venous thromboembolism in patients with cancer: a randomized controlled study. Arch Intern Med 2002;162:1729–1735.
. Anticoagulants, venous thromboembolism, and the cancer patient. Arch Surg 1981;116:405–407.
. A comparison of the safety and efficacy of oral anticoagulation for the treatment of venous thromboembolic disease in patients with or without malignancy. Legnani C, Lee A, eds. Thromb Haemost 2000;84:805–810.
. Recurrent venous thromboembolism and bleeding complications during anticoagulant treatment in patients with cancer and venous thrombosis. Blood 2002;100:3484–3488.
. Treatment and secondary prevention of venous thromboembolism in advanced cancer. In: Noble SIR, Johnson MJ, Lee A, eds. Venous Thromboembolism in Advanced Disease: a clinical guide. First edition. Oxford University Press 2008:91–110.
. Venous thromboembolism and cancer: guidelines of the Italian Association of Medical Oncology (AIOM). Crit Rev Oncol Hematol 2006;59:194–204.
. American Society of Clinical Oncology. American Society of Clinical Oncology guideline: Recommendations for Venous Thromboembolism Prophylaxis and Treatment in Patients with Cancer. J Clin Oncol 2007:25:490–505.
. Management of venous thromboembolism: a systematic review for a practice guideline. Ann Intern Med 2007;146:211–222.
. Antithrombotic therapy for venous thromboembolic disease: American College of Chest Physicians Evidence-Based Clinical Practice Guidelines (8th Edition). Chest 2008;133:454S–545S.
. Management of venous thromboembolism in patients with advanced cancer: a systematic review and meta-analysis. Lancet Oncol 2008;9:577–584.
. The use of long-term low-molecular weight heparin for the treatment of venous thromboembolism in palliative care patients with advanced cancer: a case series of sixty two patients. Palliat Med 2007;21:473–476.
. Venous thromboembolism in patients with advanced cancer under palliative care: additional risk factors, primary/secondary prophylaxis and complications observed under normal clinical practice. Palliat Med 2008;22:965–968.
. Is long-term low-molecular-weight heparin acceptable to palliative care patients in the treatment of cancer related venous thromboembolism? A qualitative study. Palliat Med 2005;19:197–201.
. Controversial issues in thromboprophylaxis with low-molecular weight heparins in palliative care. J Pain Symptom Manage 2008;36:e3–e4.
. Dose escalation of low molecular weight heparin to manage recurrent venous thromboembolic events despite systemic anticoagulation in cancer patients. J Thromb Haemost 2009;7:760–765.
. Management of refractory venous thrombosis associated with malignancy using a supra-therapeutic enoxaparin regimen. Ir J Med Sci 2009;178:339–341.
. Fixed-dose low-molecular-weight heparin for secondary prevention of venous thromboembolism in patients with disseminated cancer: a prospective cohort study. J Thromb Haemost 2004;2:1311–1315.
. Hemostatic radiotherapy in carcinoma of the uterine cervix. Int J Gynaecol Obstet 1995;50:281–285.
. Thromboembolic complications in patients with advanced cancer: anticoagulation versus Greenfield filter placement. Ann Vasc Surg 1991;5:186–189.
. Greenfield filter as primary therapy for deep venous thrombosis and/or pulmonary embolism in patients with cancer. Surgery 1991;109:12–15.
. Treatment of deep vein thrombosis and pulmonary emboli in patients with primary and metastatic brain tumors. Anticoagulants or inferior vena cava filter? Arch Intern Med 1987;147:2177–2179.
. Metastatic cancer. A relative contraindication to vena cava filter placement. Cancer 1987;59:161–163.
. Thrombocytopenia and cancer: use of the Kim-Ray Greenfield filter to prevent thromboembolism. South Med J 1987;80:1246–1248.
. Vena cava filters in cancer patients: experience with 50 patients. Clinics (Sao Paulo) 2005;60:361–366. NIHR Health Technology Assessment Programme. Duration of treatment of venous thromboembolism in malignant disease. HTA no 10/145, 2011.
. Factors influencing hospice thromboprophylaxis policy: a qualitative study. Palliat Med 2008;22:808–813.
. Oral rivaroxaban for symptomatic venous thromboembolism. N Engl J Med 2010;363:2499–2510.
. Dabigatran versus warfarin for venous thromboembolism. N Engl J Med 2010;362:1050; author reply 1050–1050; author reply 1051.
. Oral rivaroxaban after symptomatic venous thromboembolism: the continued treatment study (EINSTEIN-Extension study). Expert Rev Cardiovasc Ther 2011;9:841–844.